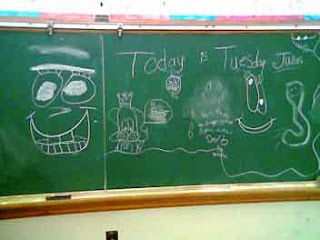 Years ago, when I was still teaching in a traditional classroom, the chalkboard provided all kinds of opportunities. 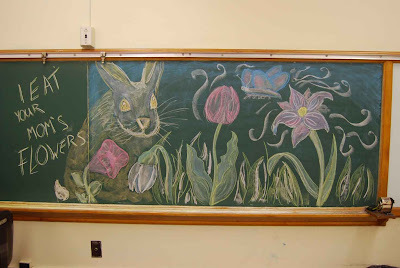 My fourth graders loved to create their own drawings with this simple medium of chalk on chalkboard. This one went up on a muggy, drizzly day. The blurry writing in the middle states, “Rain, rain, go away!” Earlier in the day it said, “Rian, rian, go away!” until someone more astute took eraser in hand and played editor. Over the weekend, La Petite came with me while I cleaned up my classroom. This was the work of La Petite, age 21, art minor, in colored chalk. In truth, the wild bunnies eat my vegetables more than they do the flowers – with the exception of the coneflowers last year. The flowers in this picture lasted longer than the coneflowers did. Note: the plethora of encores may be due to the fact that it’s the last week of school and any creativity of my own is getting poured into progress report comments. This entry was posted in bunnies bunnies everywhere, encore, family life and tagged garden, teachers live at school by Daisy. Bookmark the permalink.